HALBAN GUtech’s Beta Team has won Microsoft’s Regional Imagine Cup Competition held in Beirut recently. The team competed against 47 students in 17 teams from the Middle East and Africa. One month ago, the ‘Beta Team’ won the first prize in the Oman competition. The student team will compete in the global final competition in Seattle (USA) in July, where more than 50 teams from around the world will participate. “Our project ‘Bee’ is an app that is connected with Beacons technology for retail shops. It aims to provide customers with a unique, smart shopping experience while improving the understanding and the context of the world around the app users. Bee aims to enhance the customer experience of shoppers and to empower retailers,” said Alya Al Shanfari from the Beta Team who participated along with the team members Hana Rasheed and Sultan Mohsin Mohammed Al Subhi (pictured). The Regional Imagine Cup Competition in Beirut was held in partnership with the President of the Council of Ministers, His Excellency Saad Hariri, the GIST initiative of the U.S. Department of State’s and the American University of Beirut. Elizabeth Richard, U.S. Ambassador to Lebanon attended the closing ceremony. The Imagine Cup is supported by Microsoft Oman and Omantel. HALBAN A group of 37 students of the Department of Urban Planning and Architectural Design (UPAD) constructed a tower made of soil excavated from the GUtech campus as part of their ‘integrated semester project’. “The earthen tower which has a height of 2,3 m and weights 3,6 tonnes is an example of both progressive thinking and hands-on applied knowledge. The project was undertaken in order to explore the often under-valued potential of this material. Despite its reputation as an inferior material, raw earth remains one of our oldest buildings materials- one which is not dependant on non-renewable fossil fuels. This in addition to superior passive thermal properties positions earth as a material not only of our past, but also our future,” said Lecturer Wayne Switzer of the Department of Urban Planning and Architectural Design who initiated and supervised the entire project. Wayne Switzer has studied and experienced the construction of earthen buildings in Europe throughout the past years. According to Wayne Switzer the material can be found all over the world, in Switzerland as well as in the Sultanate, thus creating a more energy efficient, completely recyclable and ultimately more sustainable construction material for various places around the world. Over the course of four weeks, students in their 6th Semester Architecture studies produced 12 prefabricated elements made of rammed earth – overseeing the entire process from mixing, compaction, transportation and placement. Mr. Switzer noted that “the process of prefabrication shows the potential for this centuries-old technique to become viable in our current construction industry. In this way, Architecture students have an in-depth understanding of a material through hands-on experience and experimentation- a knowledge which will assist them significantly if they are to develop buildings in this technique”, adding that students may change their perception of old houses constructed in previous centuries in Oman. “Through architecture we can change the perception of this versatile material and in doing so connect with a rich aspect of Omani culture” said Mr. Switzer. It is the desire of the UPAD department to continue such projects which promote more sustainable, energy-saving building materials. HALBAN – Oman Educational Services (LLC) is well on its way to establishing itself as an education eco-system with a new target of setting up a ‘Finland Private School’ based on the Finnish education best practices. OES (LLC) is the owner company of the German University of Technology in Oman (GUtech), the Convention and Exhibition Centre for Islamic Science & Civilizations and Mahara Research Centre. OES is partnering with EduCluster Finland (ECF), a pioneer education expert organisation owned by the University of Jyväskylä; the leading university in education research and innovation in Finland. EduCluster has an extensive international experience. It is behind the establishment and the operation of the Qatar – Finland International School. ECF has achieved a recognisable milestone in GCC, in particular in Qatar, where Finland-Qatar International School is growing after merely one year of operation. This success is attributed to the great reputation of the Finnish education system worldwide. The Finnish education system enjoys high rankings and it is well perceived by policy makers, educators and parents. “It is promising and exciting to embark on establishing a private school that applies the Finnish education practices here in Oman. This is a milestone, not a destination. Educational cooperation between OES and ECF will go beyond to spread knowledge among educators and teachers in Oman” said Dr. Hussain Al Salmi – Chief Executive Officer, OES. The Finnish education practices prepare learners for life. Teachers are empowered to help out all kids. This is very important, no kids should be left behind. Teachers deploy necessary efforts to level up kids to the mainstream levels. OES and ECF has set September 2018 as a target date to open up the door for the first intake of pupils into Finland International School in Oman. This timeframe is reasonably shared and considerable plans are shaping up to ensure a smooth process of setting up the school campus in Halban. OES and ECF representatives inked an agreement that paves the ground for the first school in Oman offering pre-school, primary and secondary education on the basis of the Finnish education practices. 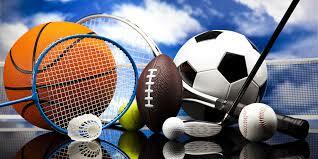 “We believe OES is our ideal partner. We have witnessed the success of GUtech, and we are assured OES will bring the same level of quality and commitment to this project” reiterated Mr Jyrki Saarivaara, Chief Executive Officer, ECF. EduCluster Finland is a pioneer organization hailing from Finland. Educluster offers educational services modelled on the Finnish education system and customised to reflect local cultural settings of different countries. Meanwhile, “the partnership between OES and ECF creates the right synergy as both are related to higher education institutions, respectively, GUtech and University of Jyväskylä” emphasized Mr Ahmed Al Salmi – General Manager, OES. “The partnership is a valuable move to enrich the education sector in Oman because it allows parents and decision makers to witness the Finnish education practices at proximity” commented Mr Jyrki Saarivaara, Chief Executive Officer, ECF. “As a unique learning platform, the school would provide students with a world-class education though individualised learning paths. Additionally, the school would create opportunities for all educators and other stakeholders to maximize the positive effect of professional development, and to serve the surrounding community as a knowledge and innovation centre.” envisaged Ms. Elise Tarvainen, Director of Global Partnerships, EduCluster. HALBAN To raise awareness about saving the resources of our planet Earth, an event organised by GUtech’s Environmental Engineering students was held under the auspices of H.E. Salim Bin Nasser Al Aufi, Undersecretary at the Ministry of event Oil and Gas, yesterday afternoon. During his speech to the students, Al Aufi stressed the importance of protecting and saving resources for future generations and the role that renewable energies will play in complementing the oil and gas sector in future. The event was entitled “Towards a Sustainable Environment” and presented various student inventions and initiatives. GUtech offers a unique four year BEng programme in Environmental Engineering. HALBAN Creating awareness, conserving and saving the built tangible heritage of Oman for future generations has been of concern for various departments of the German University of Technology in Oman (GUtech). 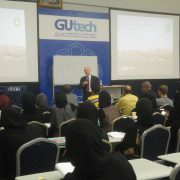 Representatives of the famous Getty Conservation Institute visited GUtech recently. Initially they were invited by Prof. Dr. Michael Jansen, Founding Rector of GUtech, to discuss possibilities for cooperation between the Getty Conservation Institute and the department of Urban Planning and Architectural Design at GUtech. “At GUtech we are planning to conduct a damage assessment study, documenting and classifying the damage of the city wall of the Nizwa oasis. Humidity and human influences have been damaging the wall continuously,” said Prof. Jansen, who is an urban historian and archaeologist. To promote conservation among the professional community in the Middle East and northern Africa, the Getty Conservation Institute is planning to conduct a training course on the conservation of earthen sites for mid-career professionals in the UAE, using some of the amazing earthen sites of Oman as case studies. 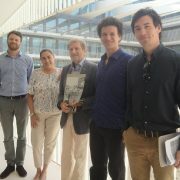 “Our aim is to bring together professionals who are working in the field of architecture, urban planning, urban history and other sciences such as geosciences for a conservation course to be conducted by the Getty Conservation Institute in the coming years,” said Claudia Cancino, Senior Project Specialist at the Getty Conservation Institute. “GUtech is an excellent institution for supporting such a conservation course. With our knowledge in architecture, urban planning, engineering and geosciences we are committed to contribute to solve engineering and as well social issues that are of high importance for the society in Oman,” said Prof. Dr. Ing. Michael Modigell, Rector of GUtech. The Getty Conservation Institute is part of the Paul Getty Trust which also consists of the Getty Museum, Getty Foundation and the Getty Research Institute. In the past years, the Getty Conservation Institute has been conducting various conservation filed projects and workshops in cooperation with institutions in China, Italy, Peru, Tunisia and Morocco, among others. In Morocco the Institute supervised the conservation of earthen Kasbah Taourirt in Ouarzazate. HALBAN To reduce garbage in our environment, a group of five GUtech students has invented a bioplastic injector molding machine that can produce biodegradable plastic. “The aim of the project is to reduce the use of non-recycled plastic which causes environmental damage,” explained Ghadeer Al Lawati, Process Engineering Student at GUtech. 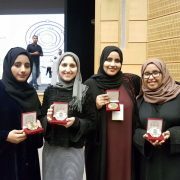 The team comprising Ghadeer Al Lawati, Manar Al Hamdani, Samira Al Subhi, Tejaz Janardhan, Wafa Al Akhami won the 3rd place in the 7th Engineering Students Exhibition held recently in the College of Engineering at Sultan Qaboos University. Their project was supervised by Prof. Dr. Najah Al Mahanna, Head of the Engineering Department at GUtech. 45 different teams from twelve universities in Oman participated in the Students Exhibition. “The competition required an idea that adds something new to the industry while expressing both our engineering and entrepreneurial skills. With our idea we want to avoid harming the ecosystem. We proposed an alternative starch based biodegradable plastics that is renewable and can be recycled by adding plasticizer,” said Ghadeer. The students’ project was split into two stages. Stage one relied on producing biodegradable plastics using a type of corn that has a fast growing rate thus not competing with food resource. “By then adding plasticiser we gave it the thermoplastic characteristics and allowed it to be recycled,” she said. In stage 2 the aim was to construct a small injector molding machine in order to change the amount of plastics obtained in the first step. The student teams’ future ideas are to produce a high quality bioplastic product and to promote the invention in the plastics industry in Oman and abroad. The Computer Science Club of the German University of Technology in Oman (GUtech) in cooperation with Google Development Group Muscat, has organized for the first time a public workshop, a so-called ‘Boot camp’ about the ‘Internet of Things’ last week. Around 30 high school students and university students from around the Sultanate attended the one-day event that was held at GUtech. 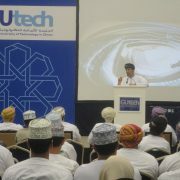 The speakers were mainly students who are studying Computer Sciences at GUtech or they were part of the ‘Engineering Village’ organization that creates awareness about engineering issues or the Google Internet group based in Muscat. During the event GUtech students explained the Arduino Smart Technology on various examples, such as a light sensor for automatic street lights and humidity and temperature sensors. 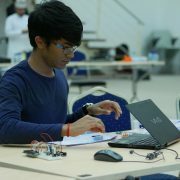 Therefore giving participants the opportunity to create their own projects and get hands-on experiences with the Arduino Smart Technology.